Fundraiser by Yuka Ioroi : Keep Cassava Open on Balboa Street! 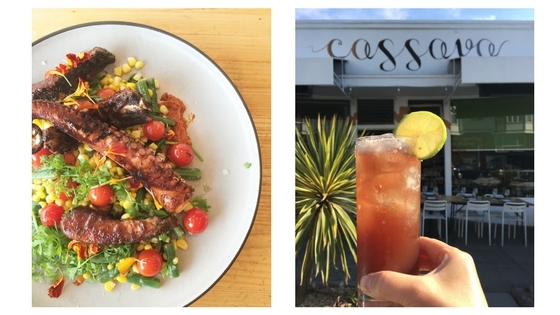 Keep Cassava Open on Balboa Street! Thank you all for your support! After 1 month, we were able to meet the goal and more! So that people that are recently finding out about this offer, we'll leave the gift certificate deals on the page. Please look forward to GoFundMe contributor only invitations on our upcoming dinner events. The first one we are planning is a sake pairing dinner in May! Please don't hesitate to use the gift certificates or discounts :-) We love seeing you all in here and every time we get to say hello to you personally it's always so special. Thank you for the most amazing month in our memory and we are more committed than ever to work harder and do good for the community! We want to remind all of our friends that our weekday breakfast & lunch has a fantastic menu, and if you visit us during the Sunday & Monday dinner service it'll be a more relaxing experience with same great menu that includes 4 course tasting menu for $42/guest. We need a steady flow of business to get us pass this hurdle and for that, we would love your support during the off-peak time, as well as our weekend services! If you plan to visit us soon (and it'll be so awesome if you do! ), please put a note in your reservation of your contribution so that the discounts can be applied at the table. If you visit us during the weekday cafe time, please let the cashier staff know and we can apply the discounts on your checks. If you need them right away to visit us (yay!) or to let's say submit to school auctions, please send us a direct message. Please know that the gift certificates come in smaller values that total to the reward amount, and we ask you to use one ticket per visit so that we can control our cash flow. If you needed a specific amount for certain reasons, please let us know of that in the email as well! 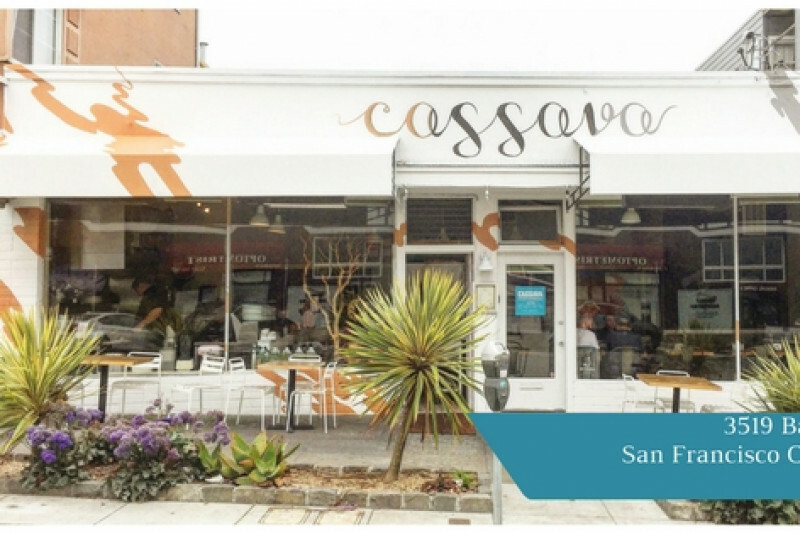 Cassava just celebrated its 5 year anniversary on March 5, 2017 on Balboa Street in Outer Richmond, San Francisco. We have to say it's been the best 5 years of our life, as this very first business of ours has blessed us with so many amazing, caring friends and beautiful life moments. Cassava has also created a thriving community on our strip that our neighbors are always generous to give us compliments for. We are always humbled when we can contribute to our neighborhood schools. We'll never forget when one of our neighborhood guests came and shook our hands and said, "you have improved the quality of my life." 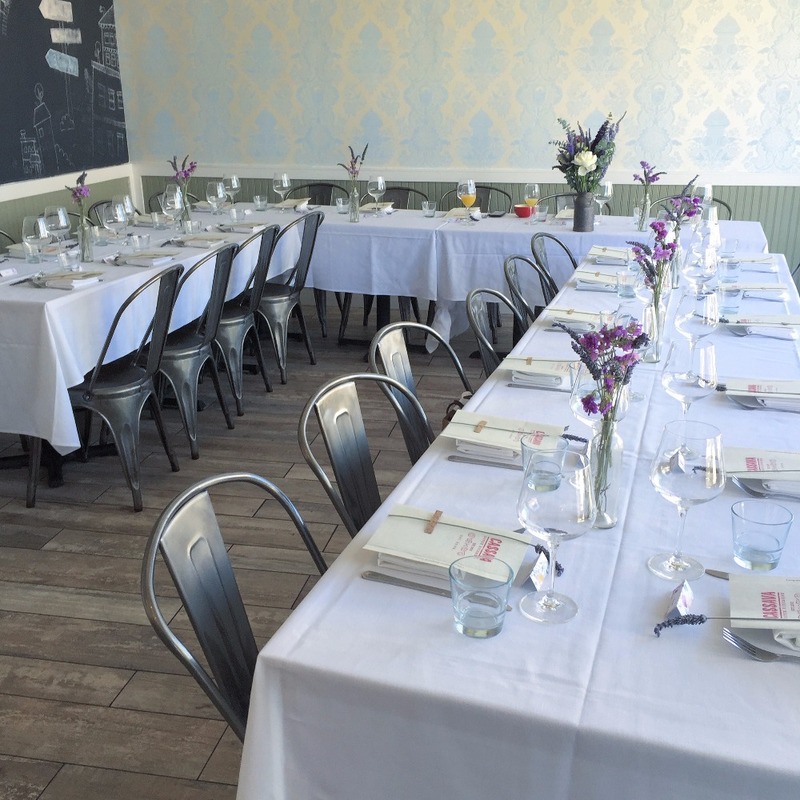 As you might have seen, we started Cassava as a tiny 450 sqft space with only 3 tables inside in 2012. Every year since then, we've added and improved to the full service restaurant that's now standing. The space itself never held a restaurant of this capacity, so it has always been the main challenge for us to keep up with the growing business that we have been blessed with. To finance the growth, we've taken on debts in many stages. As we've performed leasehold improvements the debt has increased and now it takes a significant amount of our cashflow for its repayment. Last 6 months or so (possibly from election time) we've been experiencing a slower time and now we are completely strapped for cash and facing the biggest challenge of Cassava's 5 years to stay in business. It is devastating to think we won't be part of this business that we grew from scratch. That the space becomes empty on Balboa street and that so many of our neighborhood guests that come throughout the week won't have their go-to place, so we are doing everything we can to keep it going. We need to start injecting cash into the business immediately for us to stay open this month and next month. This $50k will get us through the slower time. We would love your help and we are so thankful you took a look at our campaign! Love humbly from Kris, Yuka and the entire Cassava team. I surveyed that the shelters have plenty of things and hands and now they really need money. I used the money from last 2 days raised (I wish we could donate more) to buy things to bring to Sonoma Valley High School directly. Not yesterday but today I saw there was Red Cross presence. It'll be great if you could share this FB event post on your social media and plan to join us! Please click the link below for the FB event page. Hi guys! As soon as we enter October, the night air definitely changed and it really feels like fall now, doesn't it? Fall comes and then the holiday time and that's when we can have a bit of tough time. People go out of town and shopping for other things etc etc, we can really slow down. 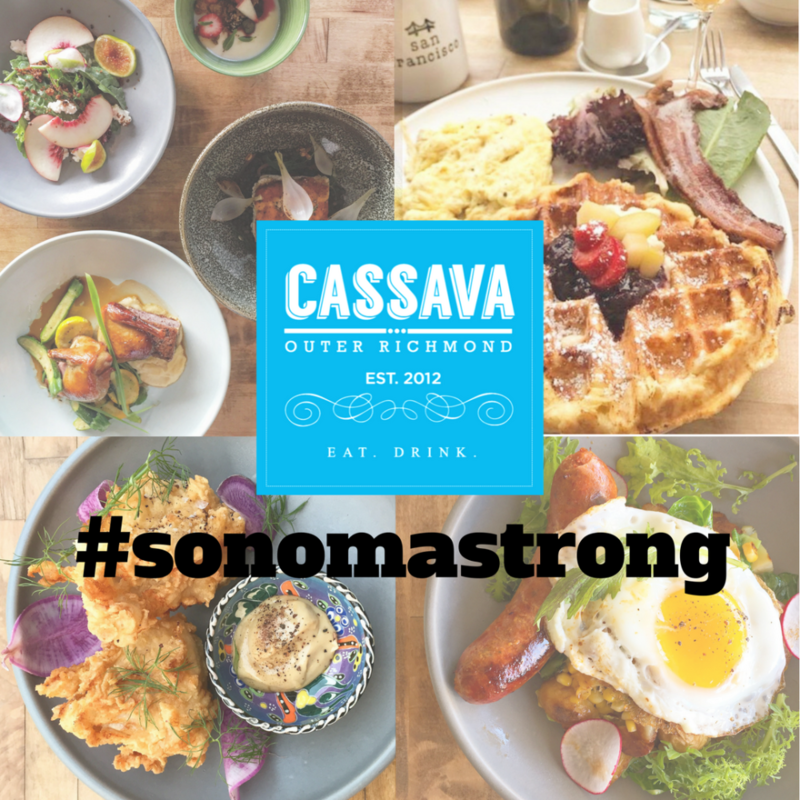 For us to stay strong until the end this year, may we ask for your help spreading the word out that Cassava is a fantastic place to host holiday parties? Maybe to your colleagues at work that plan company events, or friends planning a holiday party among friends and families? We have nice hearty fall items on the menu that's perfect for a family style meal gathering at a table. Please let us know if you needed more information! Hi guys! The September is almost over, and we are mortified how fast this year is passing by! It looks like the weekend is going to be quite nice, so come join us for brunch or al fresco dinner! As you know we really love being on our street. We are so excited to be surrounded by such amazing neighboring businesses with great food, music and art and local charm! Recently Balboa Village Merchants Association updated their website where you can see all the events in the neighborhood in one place. Take a look around, make it a dinner & movie or dinner & live music night! Hi guys! Hope you are having a great summer away from the fog! 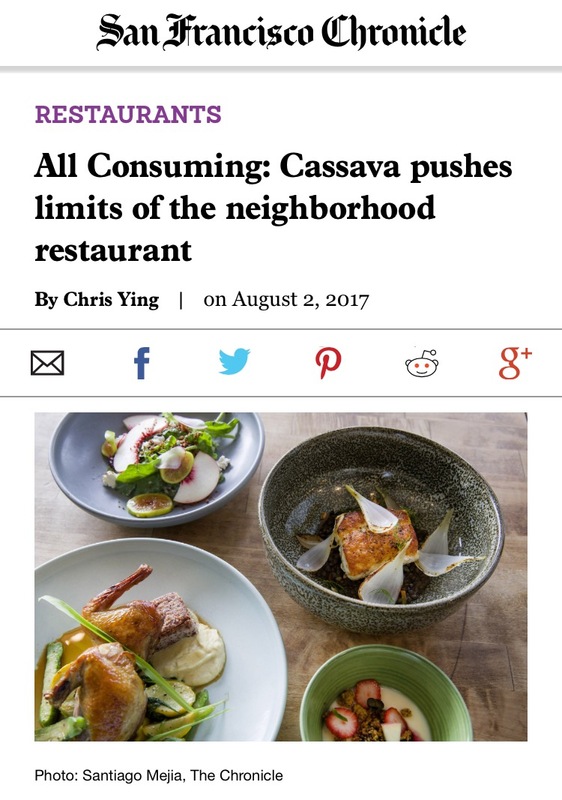 Cassava is doing alright thanks to all of your support but the entire City's restaurant industry experienced one of the slowest July's we've ever had. But we are keeping a positive look as people are coming back from the vacations this month. August started pretty awesome for us as we received our first ever feature on SF Chronicle! It's so awesome that we are getting recognized a little more as we keep going, and this campaign and how amazing you guys were really got us big attention. So thank you!!! Looking forward to seeing you guys in soon! You wish Chris Lind! It's not as easy as Yuka and Chris make it look. Not sure what you've ever done that has created a sense of community and made other people happy ( if anything) , but they had a specific vision of something special and they achieved it through hard work and sacrifice. @Chris Lind, even Marla Bakery from down the street has donated in this campaign. They're not starting their business with this money, they're initiating yet another stage of growth from the tiny little place this business began as... and it's not as if they haven't been working their asses off for five years straight just to get to this point. Walk by any time before, during, or after they're open... no one ever has time to rest at this place, because they've never put out a plate of anything but perfection from day one. Describing this as a handout when they're giving the people who donate gift certificates and/or discounts on future meals is wholly inaccurate. Ignore the troll. 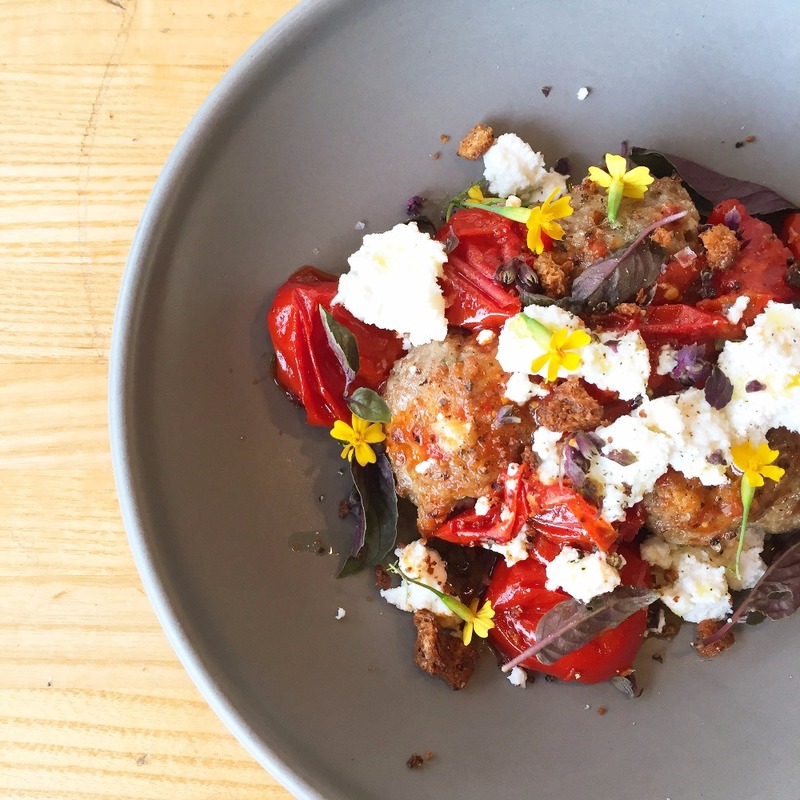 The costs of opening and running a restaurant in San Francisco are astronomic. This is about building a more sustainable business and the legions of supporters and donors understand this and thankfully are doing their part. 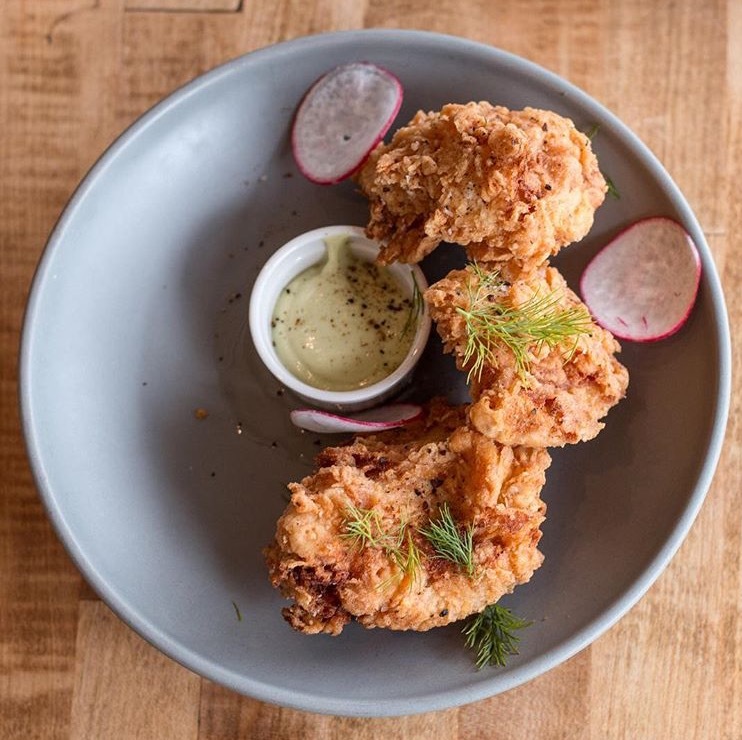 We hope these hard times pass by quickly for you guys as I know, by the very first hand, what you might be going through as a small family business owner as myself in Inner Sunset. SF is a great city, with a lot of hardship to do business in, especially for small businesses, however, hopefully hardwork pays off. So best luck to you in this journey! Lol seriously, this Chris Lind dude has had 3 different restaurant jobs in the past 4 months. How about nailing down 1 job for a few months before you go starting a restaurant. 50k wtf i could start my own business with handouts....wow! Great Job! I wish you much success! I need more info to start a GoFundMe for my business. Sorry that I have not been around, I am in a bad place at work... I miss you guys! Yippee! So glad to not have to say "farewell!"